Zimbabwean music queen, Hope Masike has dropped a new music video titled, “Tingwarire”. During a recent interview with NaijaOnlineTV, the singer revealed that “Tingwarire” is a feel good, colourful Mbira video (traditional style) with Dendera(Zimbabwean pop style), founded by the late Chimbetu. Masike said the video is simply a club/bar set up, with Dendera dancers and the popular Mozambique dance featuring herself and fellow Zimbabwean music artiste, Sulumani Chimbetu on stage. Tingwarire according to the singer, is a shona language (her mother tongue), for “let’s be careful”. The concept of the song is about two lovers, hence her featuring Sulumani Chimbetu. The two lovers ( in the context of the song ), were comparing notes on back stabbers, conniving friends, Judas Iscariots, Jezebels and Delilahs of this world, while encouraging each other to be careful of such and cover each other’s back at all time. 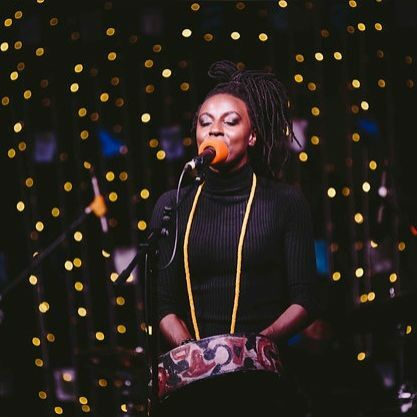 On her choice of Sulumani Chimbetu for the collaboration, Hope Masike said she has been fusing Mbira with different music styles and Dendera was certainly one she wanted to experiment with. So when the idea of the song came forth and she shared it with her producer, Mono Mkundu, it was there and then the inspiration to record the song in a Dendera style was conceived. Revealing further to NaijaOnlineTV Hope Masike said, Sulumani Chimbetu is certainly one of the leading Dendera custodians, so there was no other option than to collaborate with him on ” Tingwarire “. On her choice of Nico Abote to direct the ” Tingwarire ” video, the singer said “Nico heard the song and immediately called me, with an offer to direct the video. His offer was timely, just a day after the song was released. Then the money to shoot the video was available, coupled with the fact that he also has a fantastic profile, as a music video director”. Hope Masike and Nico Abote both came up with a concept for the video, hence the unique quality of its production. While most of the song’s video dancers were likewise selected from her music and dance school. Fortunately the video was shot in one night. Tingwarire video according to Hope Masike was shot on location at a relatively new venue called Ora, in Harare, Zimbabwe. The concept of the video is to showcase mainly the healthy and natural blend of the two music cultures, i.e Mbira and Dendera. Then also showing that between two lovers is the responsibility of protecting the relationship, by being careful in all the true meaning of the word. Nonetheless the singer revealed that her fans should expect the video of “kwira gomo”, as she informed that though its a high budget project, hence its delay. The singer further revealed to NaijaOnlineTV about her latest album dropping mid year 2017. While she has also presently launched a Pad Access Campaign, aimed at getting sanitary wear to as much as possible girls and women in Zimbabwe, especially those in remote areas, while advocating for menstrual hygiene, when at it. The singer has been able to partner with a Zimbabwean pads company called Happy Sky. To her fans Hope Masike say, remember to be absolutely fantastic in everything you do, lukewarm is unhealthy.